Aug. 23, 2016 | 1:10 p.m. Some tree species have shallow root systems that are naturally vulnerable to windthrow. Removing damaged trees, broken branches and debris after stormy weather is a tedious task and can be expensive. Oftentimes, examining damaged trees can provide a better understanding of the cause of their failure. Three common reasons why a tree breaks or falls during severe weather are weak branch union, decayed wood and root problems. When assessing a tree, its overall architectural form and branching structure need to be examined. A mature tree leaning at a 40 degree angle or more from vertical can be a major cause of concern due to the structural imbalance in its architecture and probably will fail. These trees should be removed before the next major storm. Branch structure is largely determined by the tree's natural growth characteristics. A tree with strong branch unions can resist windstorms and withstand heavy snow loads. A strong branch union to the tree's main or lateral stem is characterized by a broad angle (called a "U"-shaped union) and has an upturned branch bark ridge (a strip of raised bark between the branch and main stem union). A weak branch union occurs when a branch and stem (or co-dominant stems) grow closely together where the bark is formed inside a tightly narrow connection (a "V"-shaped union) and is termed "included bark." As a trunk and branch grow, a narrow union becomes weaker and is more prone to failure. 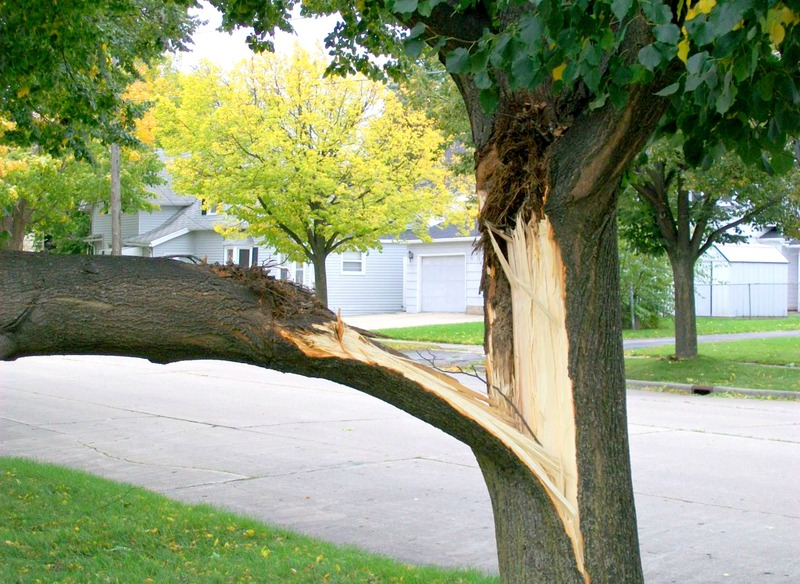 Almost one-fourth of urban trees that fail during a windstorm are due to a weak branch union. Corrective pruning at a tree's young stage can prevent weak unions. Lindens, silver maple, boxelder, Freeman maple, red maple, Callery pear, hackberry and willow are well known for developing poor branching structure. Weak branch union is a common reason for damage among urban trees. When a tree is wounded — in urban environments, probably causes are damage to the bark from lawn mowers or motor vehicles, improper pruning or vandalism — decay-causing pathogens penetrate the internal wood and destroy the tissues. These pathogens weaken the structural stability of the tree and cause a tree's failure. Common symptoms of decayed wood are hollow holes, visible rotting, mushrooms, conks (shelf-like fungi), bulges and large cracks. If more than 40 percent of the tree trunk surface area or its branches show an indication of decay, the risk of a tree's failure is high. Heavy rain accompanied by high winds can uproot and topple large, mature trees, which is referred to as windthrow. Certain tree species (willows, poplars, cottonwood Norway maple) have shallow root systems that are naturally vulnerable to windthrow effects, which can explain why one of these and not a nearby tree might blow over. When the ground becomes soft and saturated with moisture from heavy rain, the preceding wind can easily lift the shallow roots and blow down the tree. Other factors that can contribute to windthrow effects are construction damage to trees' main root systems and confinement of root spread by trenches or landscape edging materials installed deep into the soil. Identifying and addressing these common defects can help ensure safety and prolong a tree's lifespan. Tree health and risk assessment are best conducted by a certified arborist and should be done on routine basis.